If you were lucky enough to experience Falls the Shadow, you saw an event that could only have taken place at the Guggenheim Museum. 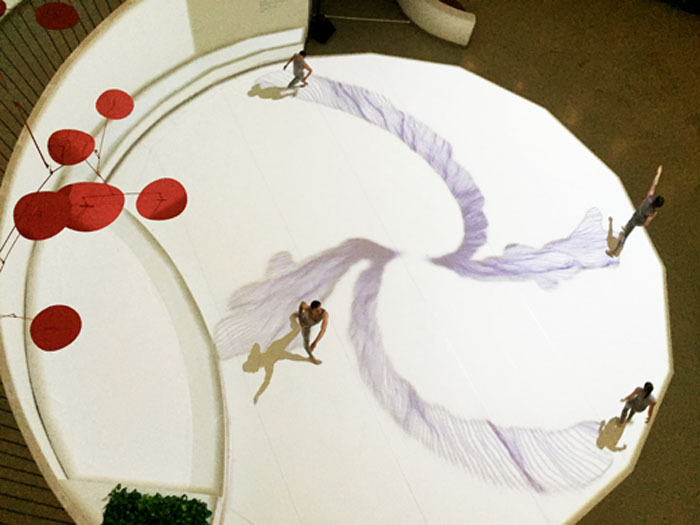 Created for the building’s spiraling rotunda and expansive ground floor as part of the museum’s Works & Process Rotunda Projects initiative, this dance was designed to be seen from the rampways that coil upwards. But unlike a Busby Berkeley production number, where multiple dancers formulate dynamic patterns read in plan, this piece interplays the sinewy bodies of four dancers with the motion-activated videos that interact with them. Seen on the inside of the rotunda, as well as on the floor and on the dancers’ bodies, the projections are fluid and undulating. The digital patterns radiate like iron filings, spreading out from the movements of the dancers. At one point the dancers “throw” light force fields at each other, and then tumble upwards in concentric circles, in waves, in blocks of white. Often projection-related projects at the museum have been directed at the building’s exterior, but in this project, they animate in its cylindrical interior. Falls the Shadow might refer to a novel based on the Dr. Who science fiction TV series or the T.S. Eliot poem, The Hollow Men, which uses it as a refrain. Text is part of this project as well, as phrases such as “Shape without form,” “Gesture without Motion,” “We Whisper Together,” and “Shade without Color” snake across the rotunda. The piece is a cohesive triumph, synchronizing choreography, music and imagery within the perfect container.